If you’ve been told that you need to have spinal surgery, you may be feeling a little apprehensive. You’ve probably heard that the recovery can be long and painful. And it’s true that it can be, depending on the surgery you’re having. The best way to face any fear, though, is to be prepared. Here are some tips to get you through. 1. Be willing to accept help from others. Depending on the surgery you’ve had, you may not be able to drive for two to four weeks after surgery. It could be four to six weeks before you’re able to do even light housework and anywhere from one to six months before you’re able to return to work, depending on how physically demanding your job is. Asking for and accepting help can be hard if you pride yourself on being independent, but remember that we all need help sometimes. We can help you locate a home health aide if you need outside assistance. 2. Stay on top of the pain. Especially in the first few days, you need to take pain medicine as directed by your doctor. That may mean taking a dose before the pain gets bad. Once pain sets in, it can be hard to get it back under control, and the stress of pain can not only make you miserable, it can slow your healing. If you have risk factors that make you worried about becoming addicted to opioid pain medicine, let us know. We may be able to prescribe an alternative. But realize that taking pain medicine in the immediate aftermath of surgery is not the same as taking it for chronic pain; you should be able to transition quickly off an opioid painkiller to something less strong. 3. Get the rest you need. No, you’re not lazy. Recovering from the stress of surgery is hard work for your body, and you need to give it plenty of downtime to heal. So sleep in and take naps as you need to. If you rush too much to get back to normal, you risk slowing down your healing and injuring yourself. 4. Follow doctors' orders carefully. The instructions you’re given—from how to care for your wound to what activities to avoid—are important. We want you to have the best possible results from surgery. Not following orders puts you at risk of having complications and not having the outcome you’re hoping for. 5. Do what your physical therapist tells you to. It can be hard sometimes when you’re tired or achy to follow through on your physical therapist’s advice. But the work you do now will help you recover more quickly and completely so that you have a better result in the end. 6. Be patient. Recovery from surgery takes time. Trying to do too much before your body is ready could set you back and cause the surgery to be less successful and the recovery longer. Depending on the procedure you have, it could be six months to a year before you’re 100 percent recovered from spinal surgery. But don’t get discouraged. If you follow your doctor’s and physical therapist’s instructions carefully, you can look forward to a future with less pain and more possibility than you had before. 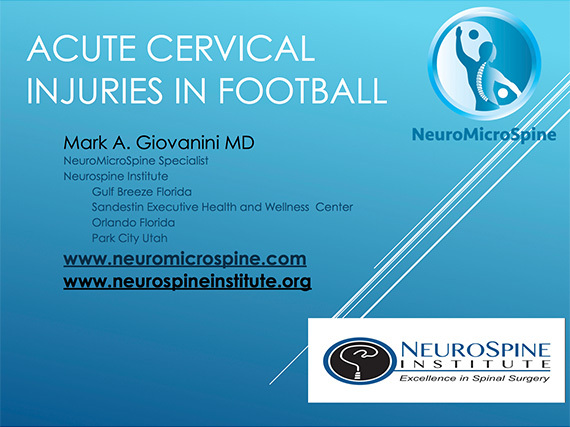 For more information on Spinal Surgery, or to make an appointment with the doctors at NeuroMicroSpine, please call (850) 934-7545 or click here to request an appointment. We hope to see you soon!